Bois Hamel offers its residential, commercial and industrial customers services featuring wood that can be used to develop the most standard to the most distinctive projects. Whether you’re an architect, designer, contractor or a home owner, Bois Hamel can support you throughout the life of your project. No matter who you are, the company makes it their mission to help make life easier, by respecting your costs, your deadlines and your needs, all while complying with the highest standards of quality. We always use the same products for any residential, commercial or industrial project, to guarantee the longevity of structures. Our team of professionals, engineers, project managers and designers all put their experience and the latest production technologies to work for you to ensure your needs are met. We even offer a free estimation service for your projects! NEW! Bois Hamel is now offering dry wood with there new vacuum kiln. 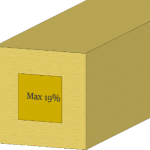 Dry wood is more predictable, reliable and stable in section size. It is the best product for engineering and aesthetic projects. Periphery Dry 1 ¼ : Where a painting or stain finish is to be applied, a wood with a maximum of 19% moisture at 1¼ inches from the surfaces is recommended. Heart Dry 19% : When the desired wood meets strict engineering criteria and high level of performance, as frequently required for commercial projects or high-quality woodwork, it is recommended to use heart dryed wood in vacuum kiln to reach a maximum moisture of 19% towards the heart of wood. 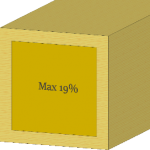 We can guarantee an average moisture content less than 19%. 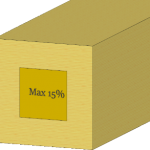 Heart Dry 15% : When the desired wood need to be used in a really drying conditions or relative humidity really low during a long period, it is recommended to use heart dryed wood with a moisture of 15 % towards the heart of the wood. Whether you’re an architect, designer, contractor or a home owner, Bois Hamel can support you throughout the life of your project. Our team ensures the satisfaction of all our residential, commercial and industrial customers, by offering a personal service for every one of your projects. Our projects are custom designed and plans are adapted to your needs and requirements. We’re there to answer all your needs and support the development of naturally distinctive projects that feature wood! We’re aware of the stakes you face every day, to continue to innovate and use the most noble, distinctive and modern materials. You’ve got the desire and the passion to conceive and imagine ambitious and out-of-the-ordinary concepts. You know that wood can add a unique touch of class and architectural style to all your projects. You know the welcoming, authentic and modern atmosphere that wood creates. We know that as professionals, you’re always looking to best serve your customers and beat their expectations. Put the experience of our team and the latest production technologies to work for your customers. We’re there to suggest any needed improvements and to guide you through the feasibility of your projects. Our limit is your imagination! Wood is without a doubt a captivating material that can be used for some truly unique projects. We know it’s not always easy to integrate wood in a project, either due to its distinctive characteristics, the lead times of your project, technological limitations or job site complexities. With Bois Hamel you can carry out these unique projects without limitations. Our experts guide you throughout the life of your project and ensure your project remains feasible. Our equipment uses the latest technologies and enables us to offer products with exceptional precision. Our technical processes, drawings, detailed assembly plans, numbered parts and more, all come together to help simplify life at the job site and increase your efficiency. We always use the same products for any residential, commercial or industrial project, to guarantee results that beat your expectations. At Bois Hamel, we put our expertise to work for you! Are you fascinated by arrangements featuring wood, to the point where their unique and authentic character captivate you? These unique ambiances capture our attention too! That’s why we’re committed to supporting you throughout the development of your dream project by offering services that support the creation of projects that feature wood. Have you been dreaming of enhancing the decor of your home for a long time, of enlarging your living space by rearranging your backyard or of offering yourself some relaxation space? Have you been dreaming of offering yourself such a warm and inviting, unique and stylish space for a long time? Log homes and cabins, solid wood frames, beams and structures, timber frames, covered and gazebos, ornaments and gables - nothing is beyond the limits of our structural experts! Go for wood and go for a team of professionals to develop your most distinctive project!